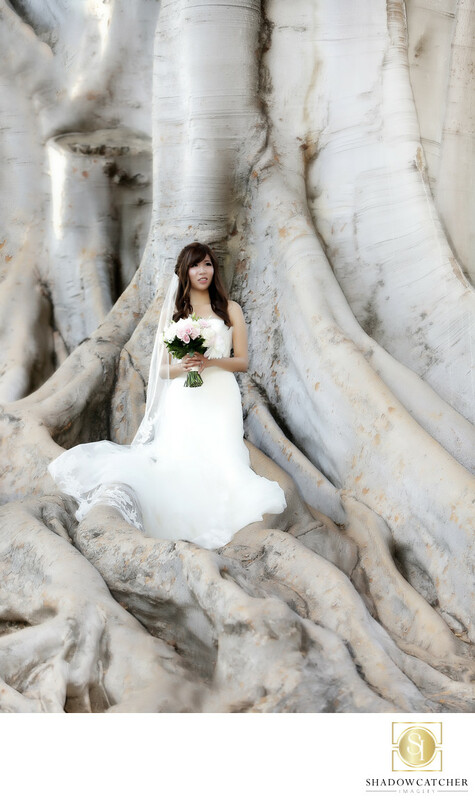 Balboa Park in San Diego is where the secret spot for this signature photo of our bride on her wedding day. The bride and groom were married at the Prado in historic Balboa Park in San Diego. Balboa Park and The Prado are two of our favorite spots for luxury ballroom style weddings. These secret tree roots are off the beaten path at the park and are a bit hidden. Our bride had seen photos we had done at the park at this spot and had requested that we do some photos of here here on the wedding day. It is a little bit of a struggle to get down into this area but with the help of our assistant and her new husband, we were able to get the bride safely into the root area, and get some amazing images. The Prado Weddings, Balboa Park, San Diego, Ca. Keywords: Balboa park wedding photographer (36), balboa park weddings (3), great wedding photos in balboa park (3).